A lager beer with a bold personality... that's one way of describing Open Rolling Stone by Baladin: a blonde beer in American Pale Ale style, but in a Teo Musso version which is outrightly original. Open Rolling Stone is a beer whose bright yellow tones and refreshing body go hand in hand with the sourish tang of hops and a vaguely peppery background: a truly Rock 'n Roll taste offering a breathtaking crescendo. Alcohol: 7.5% vol. Supremely happy on its own, it can also superbly partner grilled meat or semi-matured cheese. Ingredients Water, malted barley, hops, yeast. Allergens: gluten, nickel, histamine, tyramine. For more information on product labels, please contact our Customer Service department. The information on the labels of the products may vary for reasons beyond our control, therefore, there may be discrepancies between the information on the site and that on the products delivered. Please always check the information on the product before consumption or use. 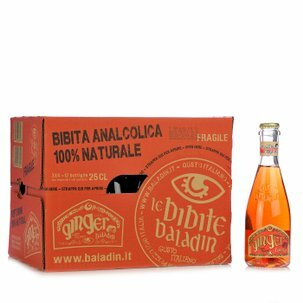 The Baladin brewery commenced activity in Piozzo (Cuneo, Piedmont) in 1996, from humble beginnings in an alehouse called "Le Baladin". Like all budding geniuses, master beermaker Teo Musso carried out his first creative experiments practically hidden inside a garage. But he soon grew bold and from the heart of the Langhe district launched his simple but audacious concept: the invention of uncompromising craft beers with a vocation for accompanying food. From this basic approach, as the years passed, the whole richly varied range of Baladin beers developed: because life is beautiful and every moment should be savoured... with its own special beer.